The PX-350MBK represents a significant step in the continuing evolution of the Privia digital piano line. A combination of a new keyboard action and a powerful new sound engine provide a new level of detail, nuance and expression for a superior grand piano experience in the lightweight and stylish design that Privia is known for. The PX-150BK represents a significant step in the continuing evolution of the Privia digital piano line. A combination of a new keyboard action and a powerful new sound engine provide a new level of detail, nuance and expression for a superior grand piano experience in the lightweight and stylish design that Privia is known for. 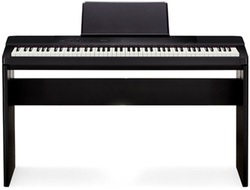 The CS-67 is a custom, furniture style keyboard stand for the most recent Privia series of digital pianos. Compatible with the PX-150 and PX-350, the CS-67 securely attaches to the digital piano and sets the keyboard at a standard piano height.